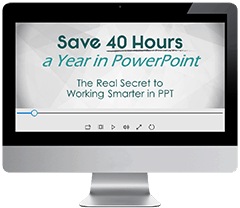 If you’ve been around the block a few times, then you know that managing all of your PowerPoint presentations is one of the biggest challenges you’ll face. So the question is, what’s the best way to do it? Well, chances are that you are current currently using some system of file folders, a file naming convention, and your emails (as a backup). What's the problem with the existing method? As such, it’s no surprise that in a recent study conducted by Research Presentation Strategies (RPS), 76% of respondents said they’ve had trouble locating a file they needed. That’s why I was so excited to meet Bob Befus, the founder of SlideSource, at the Presentation summit in San Diego. Bob comes from the world of FDA reviews, where the average PowerPoint presentation contains 2,000 to 10,000 slides! Needless to say, Bob knows a thing or two about managing large presentations, which is why his proposed solution, SlideSource, is so exciting. There are a bunch of great features to SlideSource, but here are a few game changing features that make it worth thinking about. Probably the coolest thing about SlideSource is that it keeps all your slides in one place where they are viewable, searchable, and downloadable. Yes, this means every single slide in every single presentation across your entire organization. 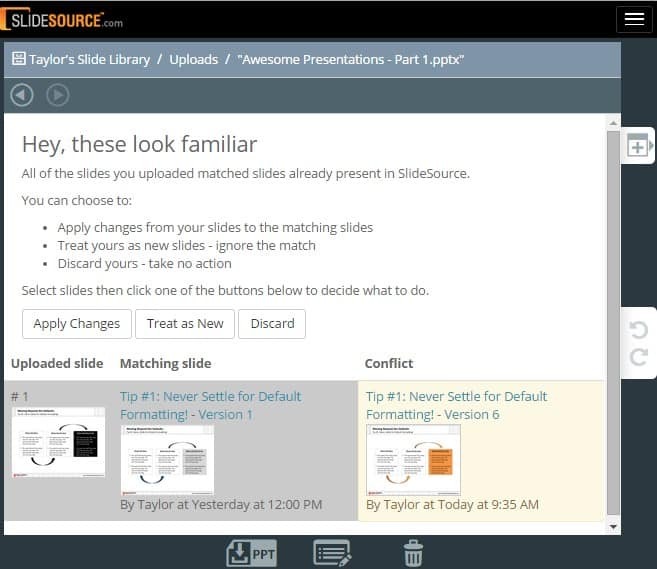 All you have to do is drag and drop your slides into your SlideSource account to upload them, and that’s it! No more sifting through servers, folders and emails to find your old slides. In the screenshot above, you can see all of the finished slides I uploaded to SlideSource. These tools make it super easy to pinpoint the exact slide and presentation you are looking for! In the study conducted by RPS, 60% of the respondents said that when creating a new PowerPoint presentation, they start from an existing slide. This response rate jumps to 72% for the subgroup of frequent PowerPoint users (those who edit or create 3 or more presentations a month). This is why managing versions of slides and presentations is crucial to any effective file management system. And that’s exactly what SlideSource does. 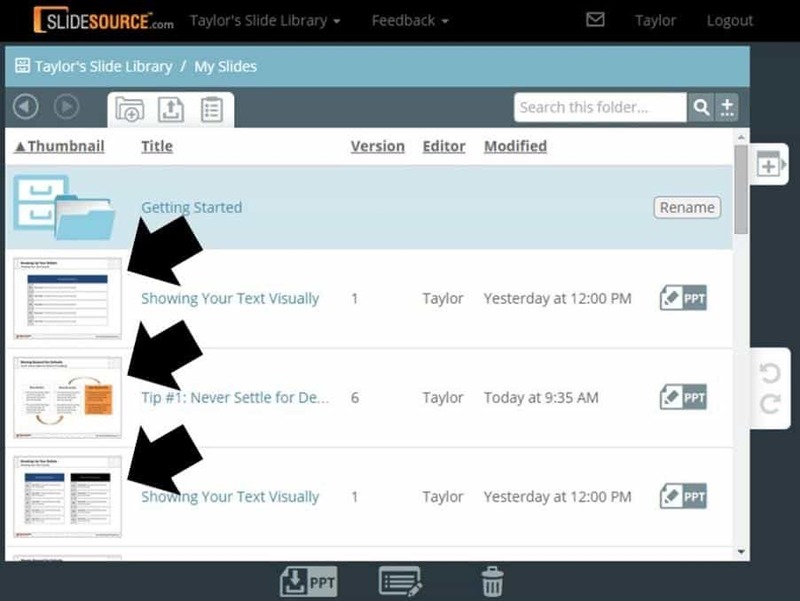 SlideSource not only keeps all of your slides in one place so that you can find them…but it also keeps all of the versions of those slides tied together! For example, below is a slide in my account that I pulled up. On the far right you can see a bunch of details about that slide, including which presentations it is being used in, and you can see that there are six different versions of the same slide. Selecting ‘view version history’, I get a list of all the previous versions, a visual thumbnail of the slide at each iteration, along with a bunch of useful information tied to each iteration of that slide. You can opt to use any version of the slide you like, either as the final version for your presentation or as a starting point for a new slide. ​If you have any questions about the contents of the slide, you know exactly when it was last updated and who to contact for any questions. 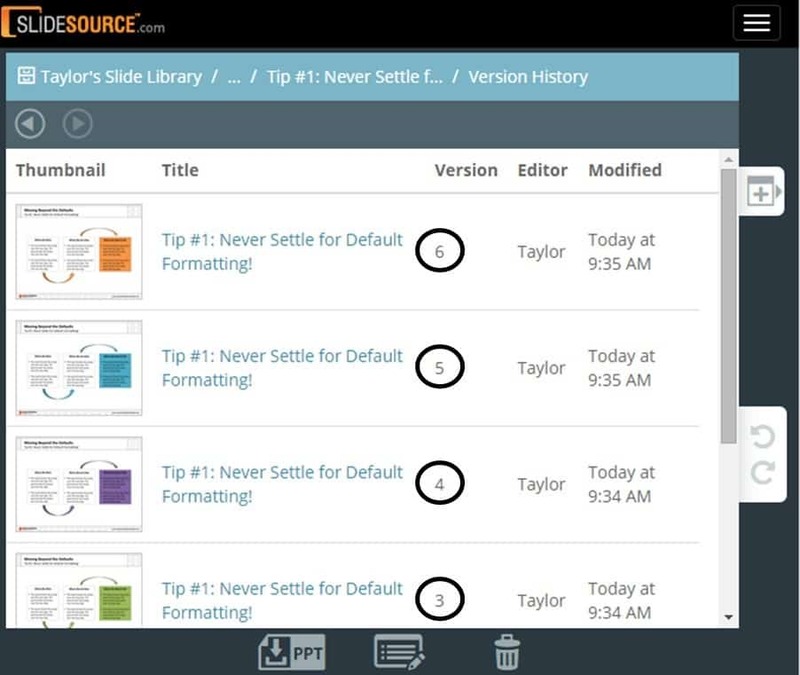 So how does SlideSource keep track of the different versions as you upload them into the system? SlideSource analyzes the slide, notes all the similarities and then flags it as a duplicate. Then it gives you options for how to handle the slide. Discard, which ignores the changes (maybe it’s an identical slide, so there is no reason to upload it back to SlideSource). So if you download a slide and make edits to it, if you want to make sure it’s kept in your organization’s file management system on SlideSource, all you have to do is upload it at mark it as the latest version. I’ve always found that one of the biggest pains of creating a new company slide (say, the “Company History” slide or the “Our Clients” slide), is making sure that it is updated in ALL the applicable decks that are floating around an organization. SlideSource solves this problem, and here's how. Because your slides exist in one place and are used to create all of the different presentations across your organization…using SlideSource, there is a direct slide to presentation link that you can easily manage. Need to update a commonly used product and services slide that is used throughout your organization? Just update the slide once, upload it into SlideSource as the “newest” version…and ALL of the existing presentations across your organization that are using that slide, by default, will be automatically updated! Now I say by default, as you do have the option, within a given presentation, to use a specific version of a slide and opt to not have the latest version automatically pulled into your presentation. This is useful if you have a specific client presentation or client deliverable, and you don’t want the newest versions of slides automatically brought in. Should you give SlideSource a shot? We think SlideSource is an amazing attempt at solving one of the biggest problems that organizations face when building and managing large amounts of content. Kudos to them for tackling something so big and complex! You need to be disciplined about using SlideSource because a system is really only as good as its users. If you go with SlideSource (or any other file management system), you’ll need to make sure you are constantly uploading your presentations back up to SlideSource to really reap all the benefits of this system. 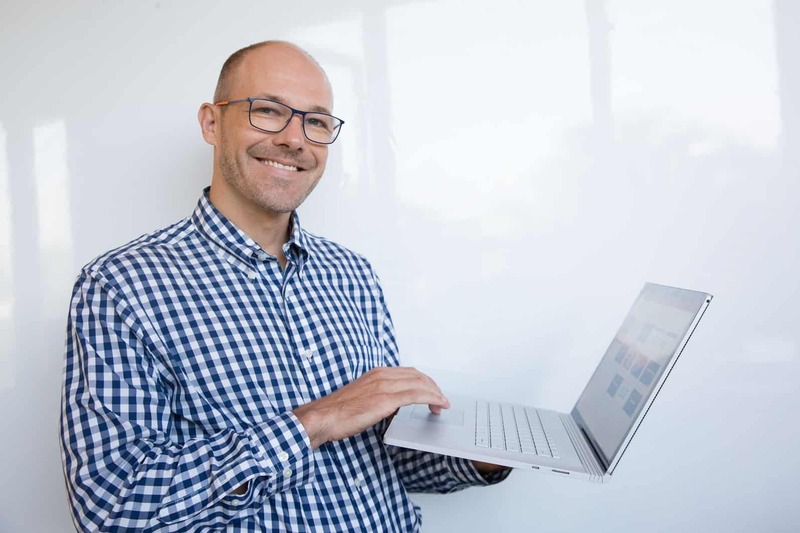 But if you train your staff or colleagues to use the same naming convention and to upload their slides to the cloud, I GUARANTEE that using this system will be a huge lifesaver in your organization. When you download slides from your account in SlideSource, each one comes with its own individual Slide Master, regardless of whether or not it was created with the same Slide Master as the other slides in your presentation. So will have to massage your slide masters around a bit if you want a clean Master View, but it’s not really a deal breaker for us in light of all the benefits SlideSource brings. And this may not be an issue forever as the good folks at SlideSource know about it and are working on a way to solve this. If you test it out, make sure to use the Feedback icon at the top of the screen to ‘Report a Bug’ or ‘Request a Feature’ and the SlideSource team will get on it. This would have been IMMENSELY useful when I was working in consulting and investment banking firms, so I wanted to be the first to bring this to your attention. Hats off to Bob and his team for striking out to solve our slide management problems! Note: Again, we are not affiliates of SlideSource so we have no other reason to recommend them other than we think what they are doing is super cool and we want to share it with you.